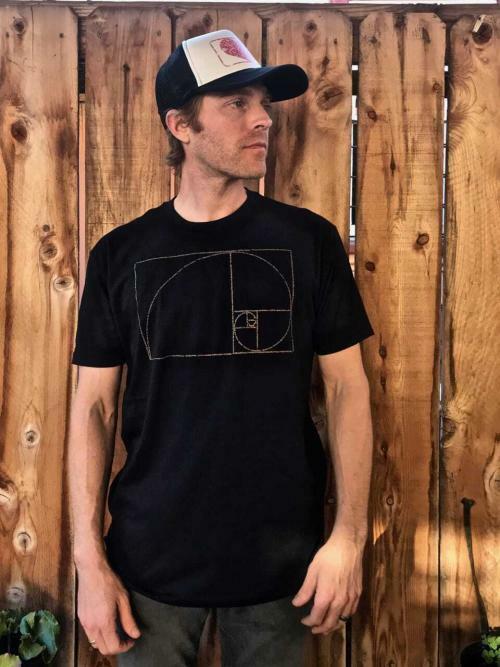 Golden Ratio design on a mens crew neck t-shirt in black. 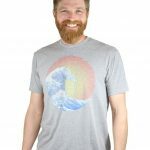 The design is made from tiny, positive quotations about the connection between Phi and the universe! 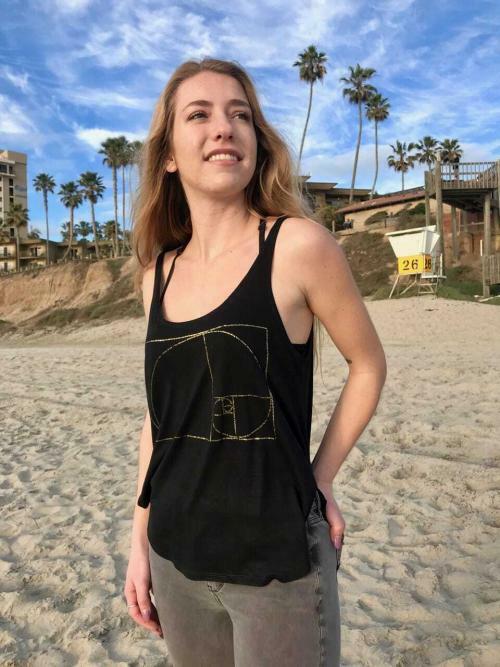 Our Golden Ratio design is made from quotations about the connection between math & nature and in the shape of a Golden Spiral and Golden Rectangle. The Golden Ratio, a.k.a Phi (represented by the Greek symbol Φ), a.k.a the Golden Mean, a.k.a the Golden Section, is woven throughout so many aspects of our human existence and the universe we live in. And yet we are mostly oblivious to its power over our subconscious. This power attracts us like moths to a light except in this analogy the light is art, beauty, and our natural sense of ‘proper’ proportions. Nature is equally beholden to the influence of the Golden Ratio. Our Golden Spiral design shows this relationship as both the Golden Spiral and a series of Golden Rectangles arranged in Fibonacci Tiling. The largest rectangle and the largest square are in proportion to each other such that the length of one side of the square ≈ 1.61803 of the long side of the rectangle. The series of Golden Rectangles rotate 90 degrees and shrink proportionate to Phi. It is called Fibonacci Tiling because the ratio of volumes of the squares within each rectangle follow the Fibonacci series (take one number (starting and add the previous to get the next — 1, 1, 2, 3, 5, 8…). 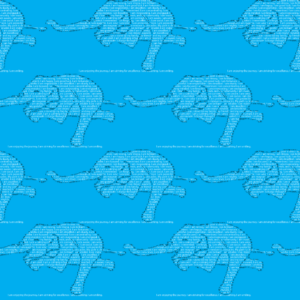 Draw your own Golden Rectangle by following along with this animated gif. Start with a square and use a string or ruler to handle the angled line that swings down. Like Fibonacci Tiling, the Golden Spiral within the design uses the Golden Ratio in that the growth factor of each quarter turn is Phi (approximately 1.61803). You can find countless examples in nature making use of this growth rate. Look directly over a pinecone or a succulent plant and you will see this pattern at use by nature! Look at satellite imagery of a hurricane or telescope imagery of a spiral galaxy and you will see this pattern at use by the universe! Look at the proportions of a human face or the shape of a human ear! You will see this pattern! If you want to draw your own Golden Spiral you can do so by first drawing the Golden Rectangle series as Fibonacci tiling. Then, using each resulting square, draw a quarter circle connecting two diagonals in the square and rotate 90 degrees doing the same to the next square. It cannot be overstated how important the Golden Ratio is in the things humans tend to find visually appealing. Why that is may very well be connected to why this ratio shows up in nature. Perhaps we are attuned to it for some reason. It’s fun to imagine what that reason may be. Do a quick Google image search for the connection between the Golden Ratio and Art, Design, Architecture to see just how ubiquitous this ratio is. If you take two sequential Fibonacci numbers and divide larger one by the smaller one you will approach Phi. The resulting number will get closer and closer to Phi the deeper into the Fibonacci series you go! Take a look at this table showing the first 20 digits of the Fibonacci series. By taking any number in the series and dividing it by the previous number in the series we get the resulting ratio in the 2nd column. The third column shows the difference between this resulting ratio and the Golden Ratio. The last three columns just continue the series for the 11th through 20th numbers in the Fibonacci series. As you can see the further in to the Fibonacci series we go the closer these ratios approach Phi. A table exploring the relationship between the Golden Ratio and the Fibonacci series. 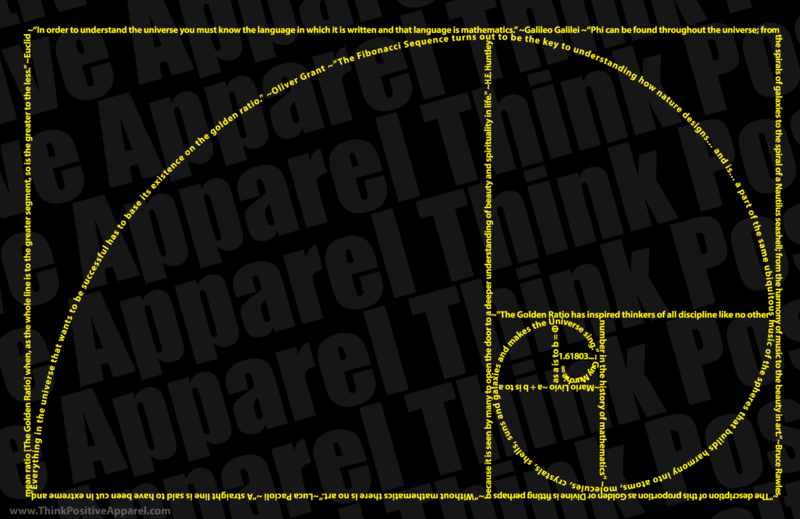 A close up look at our Golden Ratio design on a mens crew neck t-shirt in black. The design is made from tiny, positive quotations about the connection between Phi and the universe! The Golden Ratio Design is made from the Golden Spiral and a series of Golden Rectangles. These shapes are made from tiny words. 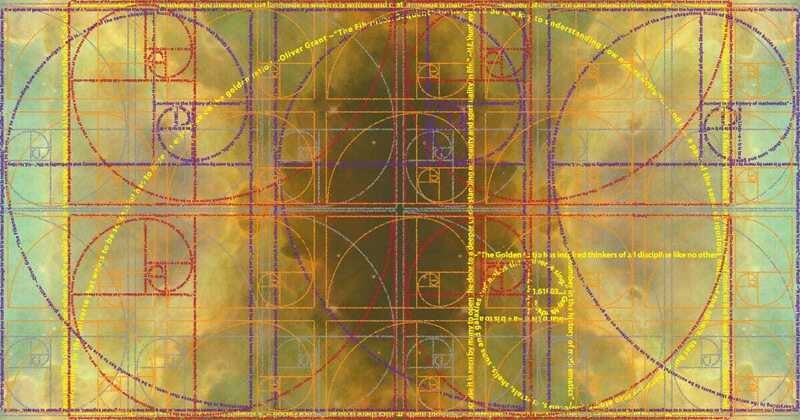 The words are quotations about the connection between the Golden Ratio and the universe. 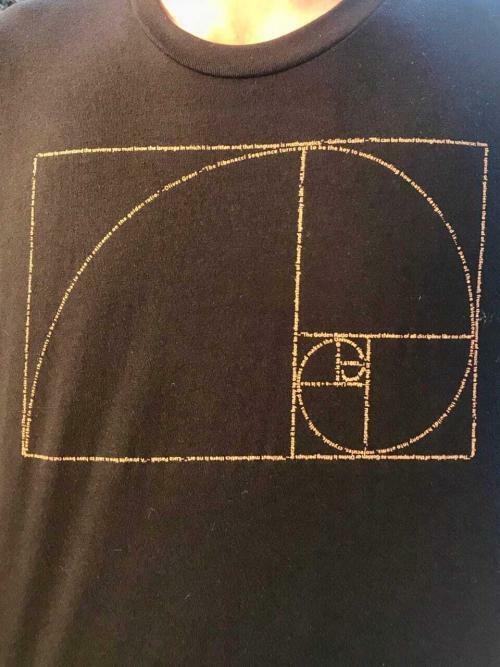 Join the conversation and let us know your thoughts on the Golden Ratio, Golden Rectangle, Golden Spiral, or its connection to nature!